Rock Hill x S.D Hydro present the 14th annual seedless 4/20 party with special guests Ty Dolla $ign, Luminox, Stranger and DJ Unite at the House of Blues. 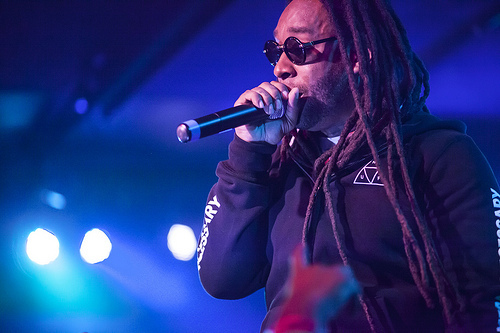 Personally, I’m excited to watch Los Angeles native, Ty Dolla $ign, who is most known for his hit “Paranoid.” But the rapper has more to come including his collaboration with Kendrick Lamar for “L.A.” which he says “it’s like the equivalent to Jay Z and Alicia Keys’ ‘Empire State of Mind’. We made an L.A. version.” Being from Los Angeles, I’m excited to make that song as my anthem for the next couple of months. His upcoming album Free TC will bring awareness to the situation of his younger brother, TC, being “unjustly locked up for a murder” according to Ty Dolla. But the album will also bring out the West Coast style of music he grew up listening to. He’s also been featured on Lupe Fiasco’s “Snitches.” Check it for yourself. Luminox is also another favorite among college students. He just finished performing at the Nokia Theatre in Los Angeles with Krewella but you can watch him perform at the House of Blues for the 4/20 party. His influences include Pharrell, Timbaland, and Led Zeppelin. Check him out if you haven’t already and go like his Facebook page! Stranger danger! Along with Luminox and Ty Dolla, the San Diego native band, Stranger, will also join the crew on 4/20. Expect a blend of reggae, rock and jazz to hit the stage. The band’s influences come from its diverse surroundings. The band is an uprising group with a strong San Diego fan base that takes over the stage with its amazing, multicultural live performances. Recognized for the Best World Music Category at the San Diego Music Awards in 2009, their performance at the HOB is about to stand out creatively. You can also catch DJ Unite from the Tribe of Kings hitting the stage. He has also joined Stranger on a couple of shows in the past. You can catch me there at the House of Blues celebrating 4/20’s all kinds of events including my birthday so stop by and say hi. It’s all about good music in the end. Tune in on Mondays 1pm-2pm with yours truly and special guest hosts for some good tunes from all types of genres only on KCR, the Sound of State.